All you need to do is post your favorite Copic Marker color in a comment on THIS POST and I'll enter you to win. 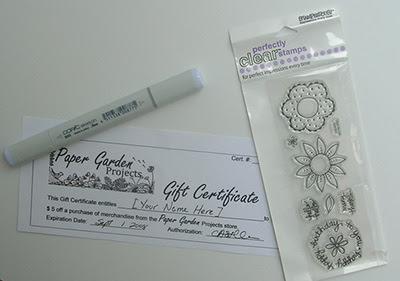 You get a B-60 Pale Blue Gray Copic Sketch marker (great for shadows), a set of Stampendous clear stamps, and $5 off any purchase in the Paper Garden Projects store. I'll be drawing the name Saturday morning. I would love to win this!! Love your blog! Forgot to say in the other post - thanks for the copics tutorial! Looks great! How can I pick just one favorite Copic? Okay, if I must. I have to say Holiday Blue, BG05. It's just such a happy color to me. Oops, okay, commented on wrong post! Hi Cathy! My favorite Copic...hmm...well, I have two! They're RV32 - Shadow Pink & RV34 - Dark Pink. They are perfect shades of pink that go with just about every pink.